Whatever it is that you want to do in the world, getting your message across in a concise and confident manner is crucial. Whatever your chosen medium, whether its on stage, radio or broadcast TV, you can totally amplify your impact in the world by learning how to have greater impact and presence when you present. We would LOVE to help you with that! If you’ve always wanted to be interviewed on TV, on stage, or online, or if you've done it before and want to do it better, it’s time to make it happen! 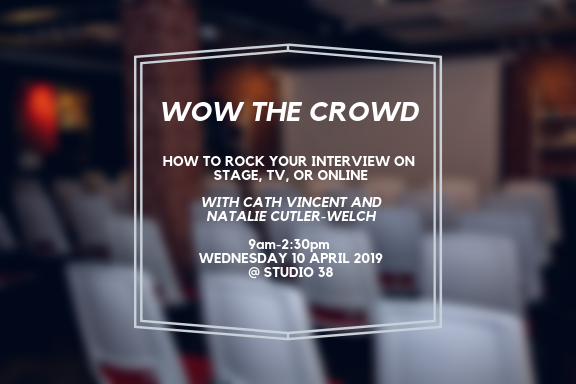 For the first time ever Natalie Cutler-Welsh (of Go to Girl) and Cath Vincent (of the Cath Vincent show) are coming together to share their insights and tips with you! Collectively, Nat & Cath have been a part of 120 TV interviews, 200+ podcasts, & countless radio interviews and panel discussions. Join us for this small group workshop where you’ll learn tips, skills and receive specific on the spot feedback & mentoring so that you can express yourself and your message more effectively. Arrive from 9am for a 9:30am start (finish time 2:20pm). Lunch & coffee/morning tea included. You can park on the streets surrounding Airedale Street for free after 6pm. Natalie is Speaker, Author & Impact Entrepreneur at Go to Girl Ltd, Go to Girl Essential Wellness & If Only They’d Told Me. As seen on the AM show, Breakfast TV and numerous online & print publications, Canadian-born Natalie is renown for her entertaining and on-point insights, talks, workshops & courses on topics ranging from resilience in business, leading with love & self care. Cath spent over 20 years as a business consultant in change management before she emigrated to New Zealand and launched a brand new career as a motivational speaker. In a rapid time, she won the National Speakers Association Brightstar award, was invited to speak on Leadership at Tedx and she even went on to launch her own motivational TV show, The Cath Vincent Show, which is now in its 4th season on Sky TV.